Welcome to the Anath In-Depth Guide. In this guide, you'll learn all you need to learn about Indines' Aspect of Devastation! Note that this guide is NOT a substitute for experience. It's always better to go out there and play some games! Marco's back at it again, writing guides for characters! He is the creator of the BattleGUIDES and BattleTIPS series, and works for Level 99 Games as a content creator. Anath does quite well against characters that easily fall to "stat checks" as her stat game is quite strong. Intense Priority can easily shut-down Karin, while her Soak and Power can do wonders against slow build-up characters like Magdelina. Well-statted and high hitconfirm characters tend to easily abuse Anath's awkwardness, making her quite sad. Characters like Riflam and Cadenza can prove to be quite effective at dealing with her. Anath is, in Brad's words, "two Hikarus stacked on top of each other." Though humorous, this is not an inadequate summary of what Anath can do. She takes whatever Hikaru does and turns it up to 11. She has more devastating effects and higher stats, but has some of the game's most awkward cards. If you like playing overwhelming but clumsy fighters, Anath is right up your alley. Identify your strong forms. Though Anath has many forms, only one or two are really useful in any given match-up. Identifying which of your forms gives you the upper-hand is crucial, as Anath will not survive if she enters a "sub-optimal" form. Play at mid-range. It might seem obvious, given the fact that she uses a halberd, but Anath is a mid-range fighter. Range 2-3 is where she is most comfortable as many of her attacks, forms, and effects are quite powerful at these ranges. Mind your forms. Anath's forms are more predictable than Hikaru's Tokens because Anath not only telegraphs her forms, but they also go on cooldown whenever she swaps out of them. This means that getting stunned can knock her out of her preferred form. Use defensive effects or Dodge to buy time and get back to your stronger form. Oppressive stat game, when played well. One of the game's strongest unique bases. Versatile with many forms and great brawling effects. Awkward effects that require some positioning to work. A noticeable lack of defenses on her cards. Anath is an awkward character to place in your roster, as she has a specific niche as a stat-roller. 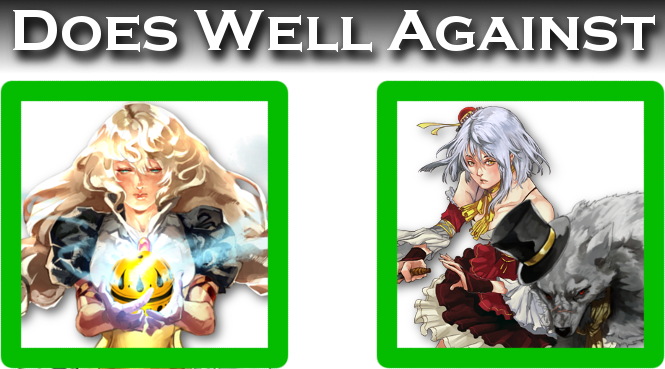 Her ability to "stat-gate" other characters can prove quite useful in drawing bans away from your other team members. Once actually in-game, Anath can exert dominance against many characters in the game, making her more than just ban bait. Anath's Aspect cards show-off just how strong her stats are. With the ability to place Soak 2 or Priority +4 on ANY attack, Anath can easily overwhelm most foes that stand in her way. This does, however, come with a few drawbacks. Each of her forms comes with a matching weakness. 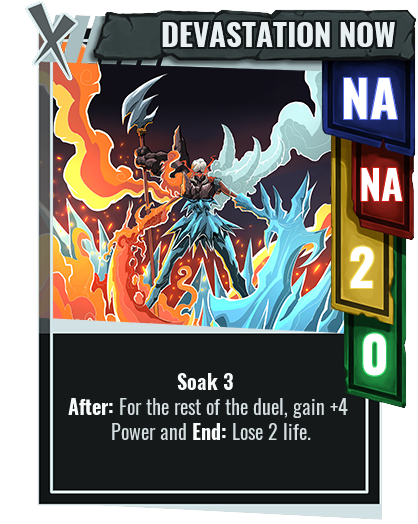 Getting Priority reduces your power, while getting Soak reduces your effective range. This, basically, turns Anath into different kinds of "stat monsters" depending on her current Aspect. She could be a speedster one minute, then a tanky juggernaut the next. It is, therefore, important that Anath manage her Aspects correctly, making sure she has access to the ones that give her significant advantages in the current match-up. We begin with what is, arguably, Anath's best style. Dread has absolutely insane hitconfrim, letting Anath hit characters at almost full-board range, especially when paired with Ranged bases. However, its true power lies in its passive effect. Dread gives opponents at Range 2 Power -3, which can be thought-of as "effective Soak 3". This is absolutely insane as it allows Anath to tank through a large majority of attacks while hitting back in earnest. This is not to say that the Start effect is "pointless." Outside of giving her hitconfirm, Dread also gives Anath amazing positioning capabilities, allowing her to close or create gaps with ease. 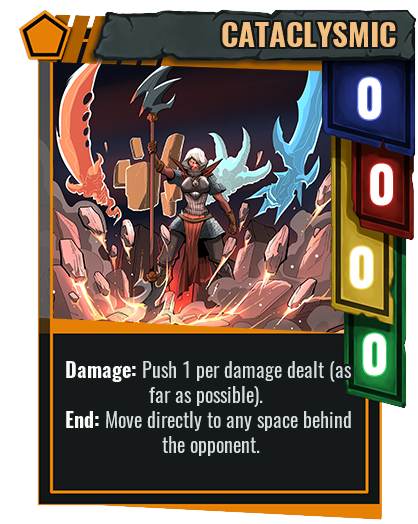 Finally, Dread is also one of her only "defensive" cards, making it easier to use her Power Aspect in conjunction with Havoc for huge damage pay-outs. Leashing is one of those mid-range styles that characterize Anath's effective range. While it is definitely useful for its ability to reposition, when played at Range 2, Leashing gives Anath an easy cornering tool and a slight damage boost to boot! However, that is not all. Leashing's other big use case is for setting-up mid-range from nearly any position. When the opponent is at Range 1, Anath can simply pull them to establish Range 2 easily. On the other hand, opponents at Range 4 are dragged towards her, establishing mid-range as well. This makes Leashing one of Anath's most versatile tools regardless of range. True to its name, Abhorrent might make quite a few players scared to use it. All with good reason. It doesn't look as "exciting" as many of her other cards. However, looks can be quite deceiving. Abhorrent is yet another positioning tool that benefits Anath greatly. Ignoring pushes and pulls allows her to stay at the specifc ranges she wants, preventing cheeky Grasp plays from ruining her attacks. This, mixed-in with the ability to set-up positioning next beat with its After effect, makes for one of Anath's better positioning cards. All of this is said without even considering what may be one of the styles biggest advantages: its Power. That extra Power +1 might not seem like much, but paired with the Priority Aspect, Abhorrent can completely decimate opponents who don't respect it. Sure Destruction lacks priority, but it easily makes up for that with its crazy hitconfirm. Range +0~2 makes nearly any base a Burst and Grasp counter, given the right circumstances. This makes Destruction a great way to ensure that Anath whacks her opponent guaranteed. Aside from this, Destruction serves as a hedge against many opponents who may try to enter melee range against Anath, who loves to be at mid-range. Should they try to approach, they will lose life, making it a risky venture. Use this to your advantage and punish people who are trying to Dodge you. Finally, its Hit effect is nothing to sneeze at. As with nearly all her other cards, this allows Anath to bob and weave, quickly establishing mid-range once again. Cataclysmic might seem simple, but it has a myriad of uses. Its primary one, which is also the most obvious, involves using its Damage effect to knock an enemy back, forcing them to miss and possibly launching them into the corner. This is great as it gives Anath some easy ways to avoid damage as well as position for some easy "free damage" the next beat. On the other hand, Cataclysmic's more "exotic" uses are seen in its End effect, which allows Anath to teleport behind the opponent. This effect usually fizzles because the Damage effect often places the opponent into a corner. 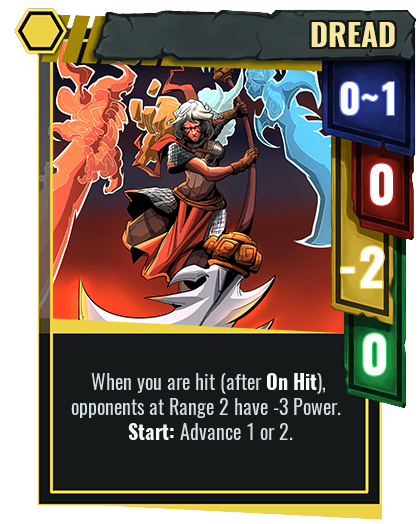 However, when used with Dodge, Anath can position herself to not only dodge the opponent's attack, but also use the End effect to position a second time, guaranteeing that she always has the range she wants. Anath's unique base is littered with HUGE numbers. It has Power 5, Range 2, and an Advance 3? Now, this is quite a hard base to evaluate at face-value due to the fact that its quite "hard" to actually see what its effective range is. The Start Advance 3 and Before Move 1, in conjunction with the Range 2, make for quite an awkward attack. Simply put, this attack works at odd ranges if Anath switches sides with the opponent using the Start effect. If she does not switch sides, it works at even ranges. This, of course, does not consider the range modifiers from your cards. Essentially, this attack's hit confirm is way better than it looks, giving Anath easy access to an attack that technically works at "any" range. Mix that in with its HUGE base Power and Anath can ruin people's lives with Havoc. Pair this with things that give Anath more Range, Defense, or Priority and watch as your opponents melt under its might. Many of Anath's cards actually act similarly to the Force Special Action as many of them have "blank" stats. This is, therefore, more used to play into getting more Force, which can be crucial as Anath benefits greatly from having access to bonus stats from the Force Gauge. Specifically, Force Stun Guard is quite useful for giving her added defenses while in Soak Aspect. This finisher looks quite powerful, and it is. The ability to deal that much damage at such a high priority can be back-breaking. It does, however, share the many common weaknesses of similar finishers. Mainly, Dodge and Burst ruin it completely. Use this to pressure your opponent and possibly mount a huge come-back, as it often guarantees a win if it connects. This is the much easier finisher to use. Once Anath is low enough, simply go into her Soak Aspect then play Devastation Now, granting her Soak 5, which almost guarantees that this goes off without a hitch. Once activated, Anath goes from "awkward but powerful" to "awkward but will kill you and all your descendants in one hit." The huge boost to Power negates the negative aspects of the Priority Aspect and then some, giving Anath Power +3 AND Priority +4 on all attacks. Not a lot of characters can survive against those stats, making the life loss worth the strength gain.